Global Travel Media » Blog Archive » John Rozentals Wine Stuff For Week Beginning 3 December, With Pix Of Jason O’dea And All Three Wines Reviewed. John Rozentals Wine Stuff For Week Beginning 3 December, With Pix Of Jason O’dea And All Three Wines Reviewed. The wheel has certainly for organic or ‘natural’ wines. Just a few years ago winemakers who took on this task were labeled by the industry as crackpots dicing with failure chasing a tiny, very fickle market. No longer. Improvements in technology and a rising awareness from consumers has really turned things around. 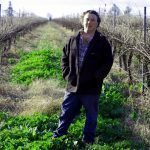 “The rise of organic, low intervention and ‘natural’ wines has been a real testament to the increasing quality of these wines,” said vigneron Jason O’Dea, who helps run Canowindra’s Windowrie and is a key part of The Natural Wine Co, a collective of wine-community professionals who initially banded together to fill a niche for an organic, preservative-free, low-intervention, fruit-driven shiraz. “Historically, organic wines were ‘fringe’ wines, with the quality being questionable and distribution almost non-existent. “With our Natural Wine Co wines, we are aiming to produce high-quality organic wines and make them accessible. The Natural Wine Co 2018 Sauvignon Blanc ($18): A fresh, delightful young dry white which avoids some of the commonly seen excesses of sauvignon blanc. It’s made from three parcels of grapes harvested for their diversity of flavour profile, and exhibits none of the oxidized flavours traditionally associated with low-sulphur whites. The Natural Wine Co 2018 Rosé ($18): Made from the Italian red variety sangiovese, as are so many modern Australian rosés, this is a perfect tipple for the veranda on a sunny summer afternoon. Or wash down some good pizza with this dry, refreshing pink wine. The Natural Wine Co 2018 Shiraz ($18): Let’s listen to Jason O’Dea regarding this excellent full-flavoured dry red: “The 2018 vintage was warmer than average in our region with mostly dry days leading into harvest. Conditions for flowering were ideal and we experienced an excellent fruit set. The ripening period was ideal, with some rain prior to harvest. The shiraz’s varietal dark berry fruit flavours became evident at 13.5 baumé and increased in intensity until harvest at 14.5 baumé.” Well made and well said.